On the assumption that you, like myself, will sooner or later have an opportunity to return to private life under the new administration, I take this occasion to express my appreciation of your many courtesies, and to assure you that I have found it a pleasure to work with you, -- indeed, a great pleasure, which has stimulated an earnest desire on my part to continue our friendship in the years to come. [Mrs. Herrick and myself shall look forward to seeing you and Mrs. Wilson here in the Spring]. 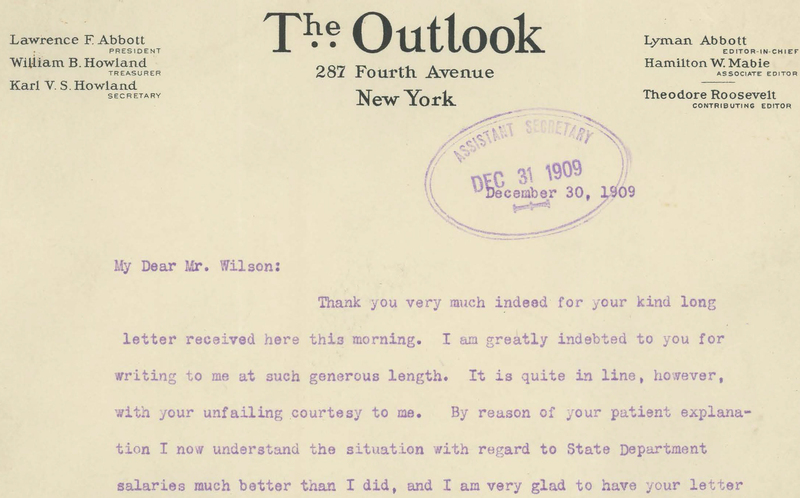 The document is stamped in the upper right corner: "Assistant Secretary, Feb 17 1913." Herrick, Myron T., "Letter From Myron T. Herrick to Francis Mairs Huntington-Wilson, February 7, 1913" (1913). Other Correspondence. 226.